About: Panna cotta, Italian for "cooked cream", is a delicious and simple dessert that can be served for any occasion. It is light and creamy, as well as extremely versatile when it comes to flavor. 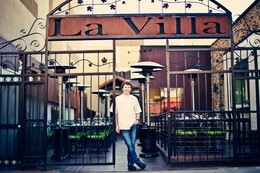 At La Villa Restaurant & Bar, chefs utilize the taste of citrus fruit to create a unique version all their own. Now you can prepare this easy-to-make dessert in your own home and share the delight of panna cotta with your family and friends. For the panna cotta: Lightly oil the insides of 13 four-ounce plastic cups. Combine the cream, milk, vanilla bean paste, sugar and the citrus zest from the three fruits in a medium saucepan over medium heat. Cook for about 10 minutes, until the mixture is thoroughly heated, fragrant and the sugar has dissolved. Place the gelatin in a heatproof mixing bowl and add about 1 cup of the hot cream-milk mixture, whisking until the gelatin has thouroughly dissolved. Add the remaining cream-milk mixture. Strain through a fine-mesh strainer into a large heatproof measuring cup. Discard the solids. Divide the mixture evenly among the individual cups. Cover and refrigerate until set. 30 minutes of preparation prior to refrigeration. Approximately 2 hours to set properly in fridge.